"41HS3, 745b, Burial A-57" by Timothy K. Perttula and Robert Z. Selden Jr.
DECORATION (INCLUDING MOTIF AND ELEMENTS WHEN APPARENT): The rim panel has 18 sets of alternate nested engraved triangles divided by four sets of excised vertical brackets; the nested triangles have hatched or excised corners. On either side of the excised brackets are four sets of small engraved pendant triangles with hatched corners. Ripley Engraved, cf. var. 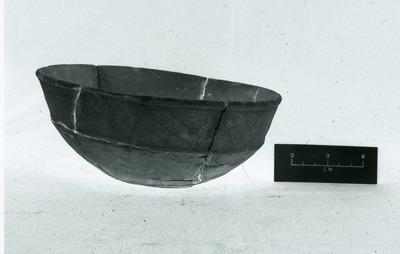 Williams carinated bowl (No. 745b) in Burial A-57 at the H. R. Taylor site.